do you know way of making draft lines by standard feature ? Please tell me the way if you have ideas. And one more that uses the tangent surface feature. Not completely intuitive and a difficult to manage interface, but the angle should be a consistent 15 degrees. As with all things that require draft angles, this really puts you in what I term "a 12D environment". There are so many ways to define the same (similar) thing that it is hard to second guess the designer or the toolmaker. In this instance, I had to go to the help pages to get some guidance on the Tangent Surface module. Even so, it was tricky to get even the basic version to work. Since the top is sloped, the 175mm offset surface is there to make sure the tangency angle is maintained. A section defined the offset required for the 15 degree tangency. Do you mean parting lines? You just have model everything that I know of. I did it for a few months, it's slow depending on the part. 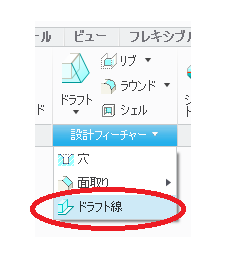 That is parting line icon. Yes I understand it's slow depending on the part. I want to know the way even if slow. Like I said, just have to model it with standard tools. Again, not knowing the part, but you can start by drawing a cavity block and a core block, assemble the blocks and the part in the correct orientation. Then you scale the part (when shrinkage tool not available). Then you can activate one of the blocks, copy all the part surfaces, and then Solidify. Do the same for the other block. Then you have a basic core and cavity to start with. I've never seen that icon before. Are you using Creo 3? 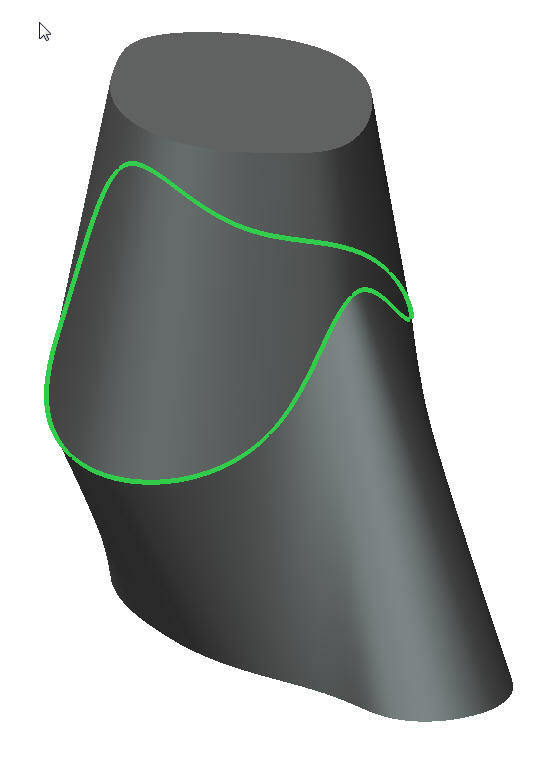 There are many ways to create and control parting lines using basic Creo Parametric. Essentially, parting line = draft hinge. 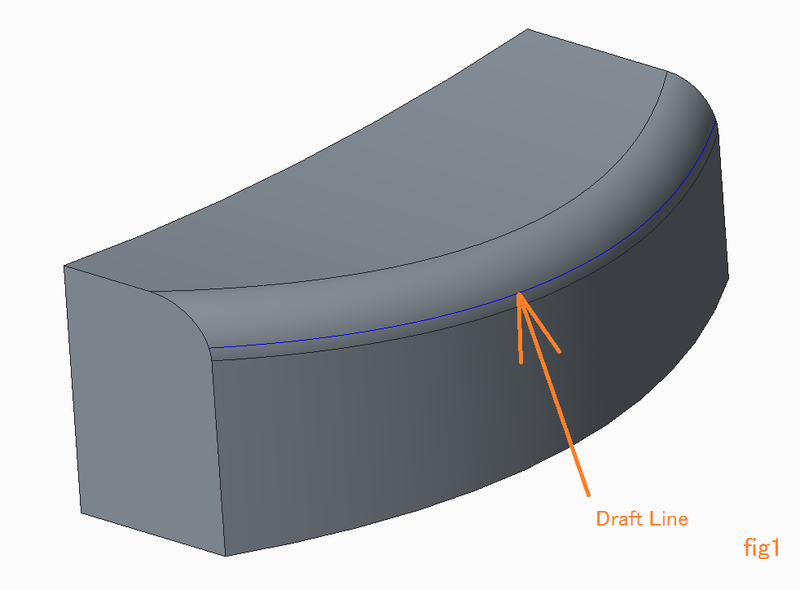 In the standard Draft and the Variable Pull Direction Draft tools you can make the draft hinge be surfaces, edges, datum planes, and sketched curves. Hinging off of a sketched curve is a really powerful capability. Combine that with the Variable Pull Direction Draft and you can get some pretty wild drafted surfaces/parting lines. If I recall correctly, there was a tutorial that showed using offset surfaces (offset by 0) to create the two mold halves. This would effectively give you an edge to develop mold tools from. I want to make draft lines for shape of fig1. it is very easy to make it by draft lines. Now I can find position of draft lines to use draft analysis like fig2 . But I don't know way of making draft lines without mold option.